From Sunday Mass to Monday mayhem: Can the central act of Catholic worship transform our daily lives? In the United States, only 25% of self-proclaimed Catholics attend Mass on a weekly basis. Many Catholics believe that far more people would attend if only the homilies were better, or the music were more inspiring, or . . . the list goes on. But best-selling authors Fr. Dominic Grassi and Joe Paprocki are convinced that the real problem lies not in the Mass itself but in a lack of understanding of how the Mass prepares each person to live day in and day out as a baptized Catholic Christian. In Living the Mass, Grassi and Paprocki show how each part of the Mass relates to our baptismal call, closing the chasm between Sunday Mass and daily life. This newly revised edition takes into account the changes in the new Roman Missal, yet rather than isolating those texts or commenting on them, the authors have integrated the changes seamlessly into the book. This assimilation ensures that readers stay focused on the core message of the book—how the Mass as a whole changes us—rather than become sidetracked by the Missal’s new texts. 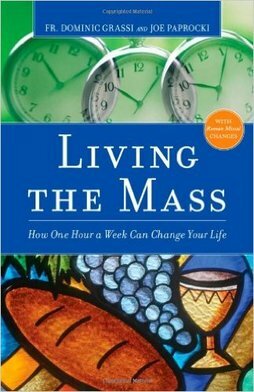 Ideal for the countless Catholics who attend Mass simply out of habit, for the many who haven’t been to Mass in a while, or for anyone seeking to join the Catholic Church, Living the Mass compellingly demonstrates how the one hour spent at Mass on Sunday can truly transform the other 167 hours of the week. The starting point for eucharistic spirituality is the table of the Lord Jesus, a truth affirmed at the Second Vatican Council and underscored in the Catechism of the Catholic Church: ‘”The Eucharist is the source and summit of the Christian life.’ ‘The other sacraments, and indeed all ecclesiastical ministries and works of the apostolate, are bound up with the Eucharist and are oriented toward it. For in the blessed Eucharist is contained the whole spiritual good of the church, namely, Christ himself, our Pasch’” (1324). A comprehensive eucharistic spiritually encompasses three aspects: celebration, contemplation, and mission. ​We live in very challenging times! Many are searching for a spirituality to suit their twenty-first-century needs and many young people have joined this search. However, I fear too few are engaged in a serious search. My hope is that this book will assist the serious searchers to find their spirituality in the Eucharist. Read the full text of the book by FRANK O’DEA SSS, a member of the Congregation of the Blessed Sacrament. 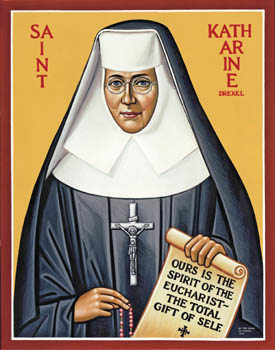 Read more about the Sisters of the Blessed Sacrament and their founder, St. Katherine Drexel.